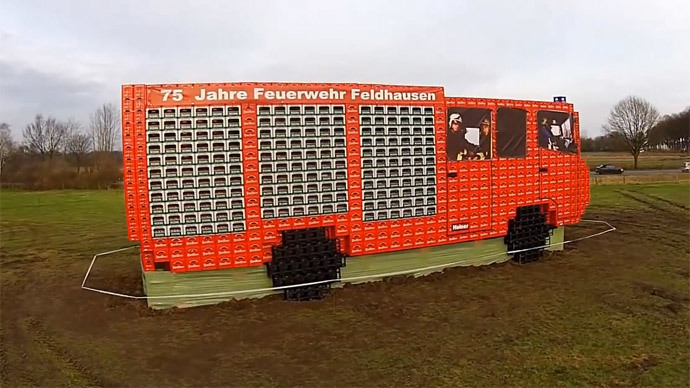 Volunteer firefighters in a small town in North Rhine-Westphalia made an attempt to break the Guinness World Record, by building a fire engine from nearly 4,740 beer crates, local media reported. It took volunteers from the Feldhausen Fire Service a whole day to construct a 15.5-meter-long “vehicle” that could be featured in the Guinness Book of Records, the Dorstener Zeitung newspaper reported on Monday. To document the event and prove that there was no cheating, participants filmed the whole process from three different angles. Now, firefighters are reviewing the materials made by eye-witnesses. A field near the town of Dorsten in northwest Germany attracted dozens of spectators who came to see how the ambitious project was carried out by cherry picker cranes and good old-fashioned elbow grease. The construction was completed by 10:30 pm on Saturday. There was a small delay, so a night shift team had to be involved. The success of the firefighters will be announced in three months, and it’s hoped that the “truck” will make an appearance at the fire department's jubilee party in July.